On January 20th, The Sydney Morning Herald published “Pill testing sounds like a great idea, but there’s a catch”, by forensic toxicologist Andrew Leibie, who reasoned that field testing is not very helpful, and might be worse than nothing. Leibie seemed to both not understand what he was talking about, and to ignore some of the key benefits of having on-site testing at events where illegal drugs might be consumed. A few days later, Monica Barratt responded with a critique of Leibie’s flawed article. In “Pill testing is still a great idea, if we use the right equipment”, she took Leibie to task for his assembling a series of partially true statements into a confused and ultimately wrong argument. I have some points I want to repeat and add, since this is something we care (and know) a lot about. First, let me just be clear about a critical function of on-site drug checking: engaging people is the most important step in harm reduction. Once people start thinking about and taking steps to mitigate the risks they expose themselves to, everything else is gravy. Leibie argues from confused and incomplete data that on-site pill testing is ineffective and may be worse than nothing. For example, he strangely compares rates of deaths from new psychoactive substances (NPS) in the UK to those in Australia, and uses the comparison to imply on-site pill testing doesn’t reduce harm. Third, it’s key to understand that on-site drug checking, what we might call “field testing”, can span a wide range of different methods. The most common are reagent tests like Marquis, Mecke, Simons, etc. These are simple “rule-in / rule-out” tests. Liquids are dropped onto scrapings or dust from a sample and may or may not change color. To a person experienced in the use of reagents tests, the color and timing can tell a lot about a sample. What reagents tests can’t do is positively identify anything. They rule chemicals in and rule them out. If a pill shaving has Marquis reagent applied to it and there is no color change, then it is almost guaranteed that the sample contains, at most, a tiny trace of MDMA. MDMA is ruled out. 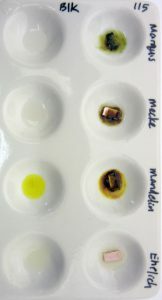 If the sample + Marquis changes to a dark purple-then-brown color, then MDMA is “ruled in”. This means simply that the reagent reaction is consistent with MDMA and not, as some believe (including some law enforcement personnel trained to use these field tests), that the sample has been shown conclusively to contain MDMA. There are an unknowable number of different reasons why the Marquis + sample could change color to the typical dark purple/blue/brown. The presence of certain dyes in a sample, temperature, a reagent past its “best by” date, opioids, and potentially yet-unknown other chemicals can produce that color when a sample comes in contact with Marquis. All we can say is, if there’s a color change consistent with how MDMA would react, MDMA is ruled in as a possibility. There are a couple things wrong with the wording of Leibie’s assessment of colorimetric field reagent testing. First, “best guess” is obviously better than a bad guess. Second, in every case I can think of, the use of a reagent test would be preferable to not using a reagent test at all. The color changes are informative but not final proof. They are definitely more relevant than a “best guess” made in the absence of any drug checking methodology. But back to the bigger error: Leibie seems to conflate on-site pill checking with field reagent testing and then draw conclusions that are out of step with current trends. A growing number of groups are using much more interesting and accurate methods to analyze and identify drugs on location at events and festivals. Groups like Austria’s CheckIt!, one of the partners in our EcstasyData lab analysis project, don’t “guess”. They run a mobile HPLC-MS unit, optimized to function reliably in party settings, and use it on-site at events to do accurate identification and quantification. Energy Control in Spain has developed procedures for using Thin Layer Chromatography (TLC) on-site, in hot and dusty tents at mega festivals. Their methodology and expertise make it possible to not only identify drugs but to get approximate quantification as well. There are groups using mobile FTIR (Fourier transform infrared spectroscopy). FTIR has been around a long time, although as an on-site drug checking method it’s very new. FTIR is definitely capable of more than a “guess”. FTIR has a long history as a lab technique, returns results rapidly, and involves equipment small enough to potentially be workable for mobile on-site setups. FTIR can be used to positively identify chemicals and is considered a proper forensic lab method for identifying street drugs. The utility of portable infrared or Raman spectroscopy in on-site drug checking is on the near horizon. Raman, IR, UV, and other absorption or back-scatter analytical technologies work by shooting a laser source at a sample and then reading the patterns of reflected or transmitted light and comparing that against a database of known patterns. In the next ten years, it is likely that the costs of these portable devices could drop below $500 per unit, and the databases of patterns could be extensive. Not quite ready for real world use, but… not too far away either. The primary reason these lab-grade testing methods aren’t more widespread is that the politics of drug checking are super horrid. There are critics, like Leibie, who are just confused about the usefulness and harm reduction aspects, but the much bigger problem is the world governments dominated by prohibitionist thinking. Prohibitionists actually argue that it is a bad idea to “make drug use safer” and provide “quality control for the black market”. In this very common paradigm, the goal is to make illegal drug use as physically risky as possible rather than trying to reduce the potential damage done to people. From my perspective that’s wholly unethical and policies based on pretending people will never take MDMA and other psychoactives are not only delusional, they are mean-spirited and unjust. But that’s the world we live in. In most countries, harm reduction work is hamstrung by the fact that it is illegal (as in go to jail) to provide accurate drug checking. It is also disallowed because event producers do not want to be perceived as “pro-drug” or possibly be held accountable for drug sales or use at their events if they’ve acknowledged that it occurs. Inviting a harm reduction team with a bunch of equipment to operate at a party is de facto condoning illegal drug use, or so goes the thinking. So, despite the viable options for offering high-quality analysis at large events, what we are often left with is young harm reduction workers equipped with small bottles of field reagents such as Marquis. Reagent tests don’t cost very much, they are affordable enough for it to be OK if they’re seized or destroyed by law enforcement, and the number one purpose for using them is still served: Engaging with people about the fact that there are risks to taking illegal drugs, that one can have a rational relationship to those risks, and the worst and most likely of those risks can be reduced with sufficient knowledge, some foresight, some help, and a little care. 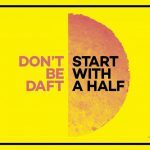 Risks from high dose MDMA tablets are explicitly acknowledged through social media marketing methods, such as Global Drug Survey and Mixmag’s public health message, “Don’t Be Daft / Start with Half” (UK). That sentence is deceptive because of the word “often”. Water is a deadly poison. A high dose of water is often fatal by itself. Aspirin is a deadly poison. A high (enough) dose of aspirin is often fatal by itself. Leibie properly points out that MDMA and meth, even when they are of known quality and quantity, are not totally safe. And there are cases of people doing reasonable doses and still dying. But those cases are extremely rare. There is little evidence that people frequently die from taking MDMA or methamphetamine that is higher in potency than they expected. Some tablets sold in Europe contain over 200mg of MDMA, a startlingly high dose. A small woman taking that amount of MDMA could be taking a serious risk, but the chances of her dying because on-site pill checking failed to give her clear quantitative information are nearly zero. It is very likely, in fact, that if the woman in this scenario visited a harm reduction table and asked about the tablet she was thinking of taking, she would have been immediately informed that it was a strong tablet. The information that drug checking harm reduction workers provide is not limited to whether a reagent test color change is consistent with MDMA. They provide a lot of useful info and harm reduction suggestions. So, Leibie’s point, as stated, is faulty. Sample of LSD dropped on blotter tested with Ehrlich reagent turns purple. (Forget for a moment that the way the sentence is worded implies acid is a “new designer drug”…) This statement is misguided because of the inappropriate conflation of “on-site” with colorimetric field reagent tests. It’s also inaccurate because the NBOMe compounds do change color and can be ruled in or out even at very low doses. LSD (acid) is also detectable using field tests. The Ehrlich reagent turns purple in the presence of LSD. This sample of liquid LSD (far right) was dropped onto paper towel and the field tests did a fine job of showing the presence of LSD. As we have written before, NBOMes do not fluoresce under UV lamps, while LSD does, and NBOMEs show a distinct set of field reagent reactions (above). I give Liebie another “clearly wrong”. This statement underscores the author’s lack of awareness that “advanced scientific analysis” is a practical option for on-site testing, if only it weren’t disallowed in most places. It also suggests a weak understanding of the field reagents he’s so strongly arguing against. Reagent field tests can rule in or rule out two of the three most “dangerous” drugs that he lists, the NBOMes and LSD (acid). For alpha-PVP (referred to as “flakka” here), he is right that it does not change color with the standard Marquis, Mecke, or Mandelin reagents. What a tremendous teaching opportunity for harm reduction workers to talk about adulterated drugs and the uncertainty of field tests (they can even point people to illustrative examples from EcstasyData, where we have reagent results side by side with the GC/MS lab findings). It seems Mr. Leibie is arguing against having those educational opportunities at large festivals. And, while there are plenty of examples of NPS substituted for or adulterating more familiar drugs, the accuracy of the claim that this is a “frequent” occurrence is moot, since, just as the author points out that there are “no quality or consistency guarantees” for illicit drugs, there are also no representative sets of data about analyses of illicit drug samples available for public scrutiny (except maybe in the Netherlands). Law enforcement groups may analyze samples of seized drugs, but results are not typically shared with the public. Leibie makes several errors in the text he uses to support this statement. First, there is nothing like a valid apples-to-apples comparison between the different countries. Australia has a unique illegal drug market that is distinct from the UK’s. The Australian government runs one of the tightest customs operations in the world, in the confines of its own island continent, impacting Australia’s drug market much differently than the European-influenced UK. It is unclear why Leibie would feel qualified to offer a comparison of the effectiveness of unspecified relative amounts of harm reduction efforts in unspecified numbers of events with an unknown number of participants. It’s just weird. His statement qualifies as “most likely wrong”. The Netherlands are one of the only countries that has anything like a proper “pill testing route” with their DIMS project. And they don’t allow on-site lab gear at big events run by harm reduction workers. I think this is perhaps the most helpful statement in Leibie’s article. There is no question that many people misunderstand the risks of the drugs they are taking. Moreover, inexperienced use of field reagents can provide a false sense of security. People sometimes confuse lower risk with “safe”, or mistake harm reduction for harm elimination. And it’s true that, sadly, sometimes people die after taking pharmaceuticals or recreational drugs in reasonable ways. Although the prominence of Leibie’s article offered a great opportunity to discuss the pros and cons of on-site testing, particularly the entirely relevant strengths and weaknesses of reagent testing, this opportunity was missed. The author showed little knowledge of the specific area of music event or festival drug-checking. Performing tests at hot, dusty, remote events, with bass vibrations and the complexity of imaginative combinations of substances will always present challenges, but the experts running these services do tend to be well aware of these limitations. The harm reduction projects that have been set up around the world are working within the parameters of government policies that seem at times to obstruct their efforts to serve the interest of public health. Despite all these conditions, and shoestring budgets, these groups are connecting people with specialist advice, mentors and peer support to ensure that on-site drug checking makes the world better, not worse. the salient point should not be confused with politics: let Harm Reduction for fellow humans sway your vote, man. Always! Next Next post: Want to win a free EcstasyData analysis?